Four Things You Can Add to Your Master Bedroom to Make it Cozier For Fall! With Fall weather vastly approaching, it’s time to start thinking about ways to make our bedrooms fall-ready! I know we all can’t have that wonderful toasty fireplace in our master bedroom (If you do have one, you’re one lucky soul…. ), so here in this post I’ll be sharing four of my favorite things to incorporate into a bedroom to make it much cozier. This week I brought out the box of fall candles that I had tucked away at the beginning of spring last year. When I realized I had one of my favorite Whiskey + Fig candles, I did a little happy dance on the inside and scurried around my apartment to find a lighter! This amazing candle is loaded with rich notes of aged teakwood, fig and black tea, combined they create the perfect warm ambience in a space! I have one on my nightstand and the scent throw is so good that you get a great whiff of the notes without it burning! In the summer and spring we’re more likely to buy cool and crisp bedsheets, but heavier textures are essential for a warm and cozy night’s rest during the fall and winter months. My favorite option is a velvet duvet cover (or coverlet)! You can great ones at any price point, like this one from Target or my favorite one from West Elm. Let’s be honest, stepping out of bed half asleep onto freezing cold hardwood floors is sort of death defying. Putting a very plush area rug underneath your bed in the fall and winter months would be the best decision you’ll ever make! Just be sure to have the correct size rug underneath your bed. If you have a queen size bed your should have at least an 8’x10’ area rug underneath your bed. If you have a king size bed a 10’x 12’ area rug is A MUST! There are plenty affordable places to shop for area rugs, one of my budget-friendly sources is overstock.com. Not only does a faux fur throw make your bedroom look super luxe, it’s super useful! Who wouldn’t want to cuddle in bed with a good book while wrapped in those warm faux fur fibers. 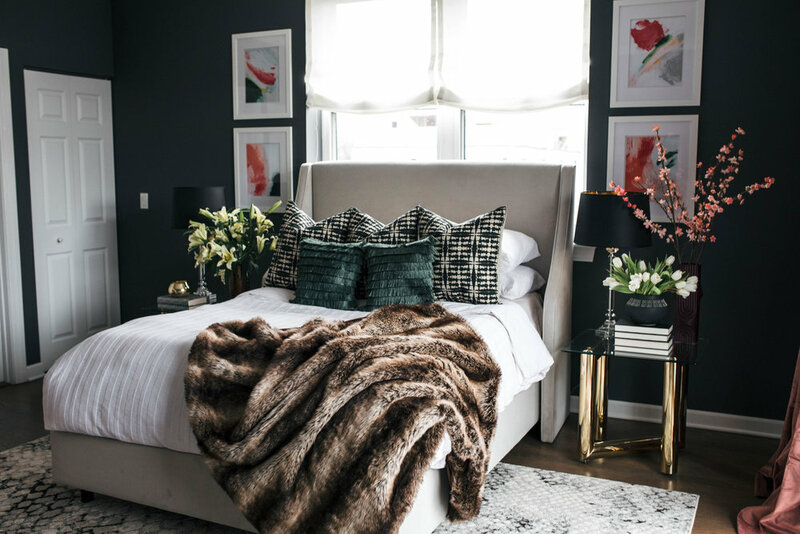 Every bedroom I design in the cooler months will always include a faux fur throw, one of my all time favorites is the one I sourced for my client at Project Kenwood! How do you like to make your bedroom cozier? Leave me a comment below, I’d love to hear from you! Ways to Update Your Home Without Spending a Dime!